Socks, plain grey, black or white. Socks, knee length or ankle socks in plain grey, black or white. Thigh length socks are NOT allowed. Black flat/low heeled sensible shoes, not trainers. Please note that canvas shoes are not allowed. Prominent logos are not acceptable. Black flat/low heeled shoes, not trainers. Please note that canvas shoes are not allowed. Top coats, sensible style and colour. We do NOT accept leather or denim jackets or those which are covered in badges. The wearing of jewellery is NOT allowed except for a watch and, where ears are pierced, one stud in the lower part of each ear. Extreme hairstyles are not allowed and this includes coloured streaks in unnatural shades. All items of clothing and equipment must be clearly named. 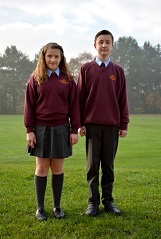 School uniform in the Summer term is the same as for the other two terms (with the exception of sportswear). On warm days students will be allowed to remove their tie or jumper in lessons if their teacher gives them permission.